Welcome to V.I.P. Gymnastics, Ninja, and Cheer! We are so excited for you to come to our facility. Please complete the following "V.I.P." form. Please click on the Search button below, then choose the "celebrity" class for your superstar. As a parent or legal guardian of the student(s) included on this registration, I understand and appreciate the risks associated with the sport of gymnastics, cheer, dance, tumbling, trampoline, and related activities. I am fully aware of the risk of catastrophic injury, paralysis, and even death, as well as other damages and losses associated with participation in gymnastics, ninja, cheer, tumbling, trampoline, dance and/or related activities. I understand that it is the express intent of V.I.P. Gymnastics, Ninja, and Cheer to provide for the safety and protection of my child and, in consideration for allowing my child to use this facility, I hereby forever waive and release V.I.P, its officers, employees, instructors, directors, coaches, landlord, and independent contractors from all liability for any and all damages and injuries suffered by my child while under the instruction, supervision, or control of V.I.P. I confirm that the student(s) included on this registration are in good health and have no known physical impairments that would cause harm by participation in any V.I.P. program. I also agree to individually provide for the possible future medical expenses which may be incurred by my child while training at, or performing for V.I.P. I hereby give my consent to V.I.P. to provide emergency care and to give authority to any hospital, or doctor to render immediate aide as might be required at the time for his or her health and safety. I hereby give my consent to V.I.P. to use my child's image in any form of media, including print, television, and internet, for advertisement and promotional purposes. Tuition is based on four weeks of class in every month. A V.I.P. Tuition Month does not always coincide with a calendar month. Tuition is due prior to the start of the student's first class and thereafter on the 10th of each month. Payments received after the 12th of the month will be assessed a late charge. If tuition is not paid in full by the 15th of the month, your child's enrollment will be cancelled. A $15 fee will be assessed for any returned checks. 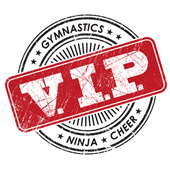 If your child is enrolled in class, we will continue to bill monthly until we receive a completed Student Drop form or written notification via Email (alisha@vipgymnasticsninjacheer.com). The Drop form or written notification must be received by the 15th of the month prior in which your child is withdrawing. If we do not receive written notice by this deadline, you will be responsible for tuition billed on the 10th of the upcoming month. You can obtain a drop form from our front desk. Please note that tuition reserves your child's place in class for the month it is paid. We cannot be responsible for the student's attendance. We are happy to offer make up classes based on space and availability of similar classes. Make up classes must be completed within 2 weeks of the missed class(es) and are void once student has dropped from class (e.g. Make ups can only be made while student is still enrolled in class and account is in good standing). A MAXIMUM of 4 make-ups are allowed per session. We cannot pro-rate or credit tuition for missed classes. We ask that you notify and coordinate with the Front Desk when you wish to schedule a make-up class. As parent or legal guardian of the student(s) included in this registration, I hereby verify that I accept the conditions of the waiver and release, accept the tuition and enrollment policies, and permit my child(ren) to participate in the events provided by V.I.P. I authorize V.I.P. to charge the credit card I put on file for all charges billed to my account. Charges that may be billed to my account include, but are not limited to: Monthly Tuition, Annual Registration, Open Gym, Event Registrations, Merchandise and applicable Team Fees.